The most famous Italian opera composer of his day, Domenico Cimarosa saw his fame spread all over Europe. Written towards the end of the �Neapolitan School� era, his operas endured in popularity long after his death thanks to their melodic invention, colourful orchestration and sheer vitality. 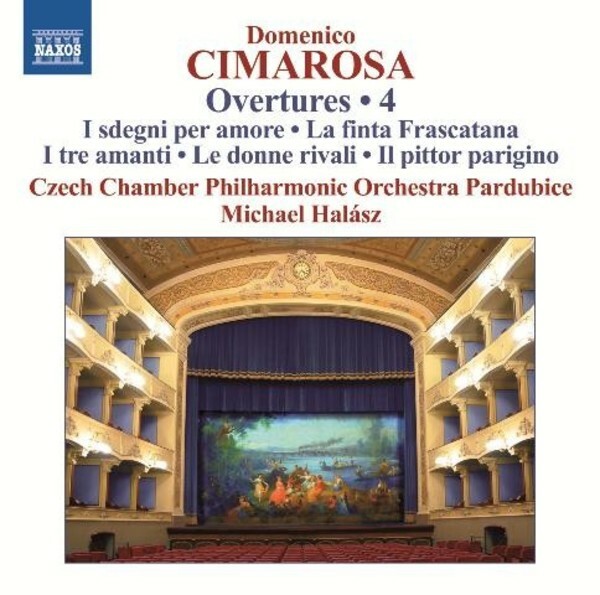 The overtures in this programme include I tre amanti (The Three Lovers), the hit opera that made Cimarosa�s name outside Naples, Il pittor parigino (The Parisian Painter), and the tragedy Giunio Bruto that were admired by Haydn and conducted by him at the Esterh�zy court. Michael Hal�sz is an acclaimed conductor of opera, and was resident conductor at the Vienna State Opera for twenty years, beginning in 1991. Michael Hal�sz�s recordings for Naxos include ballets by Tchaikovsky, operatic excerpts of Wagner, symphonies by Beethoven, Schubert and Mahler, Rossini overtures, three volumes of Liszt�s symphonic poems (described by the Penguin Guide as �one of the most successful collections of Liszt�s symphonic poems to have emerged in recent years�), Beethoven�s Fidelio, Mozart�s Don Giovanni, Le nozze di Figaro and Die Zauberfl�te. He has also recorded Pergolesi�s Stabat Mater and Orfeo, and Richard Strauss�s Bourgeois Gentilhomme, and, for Marco Polo, Rubinstein�s ballet music and Don Quixote, Schmidt�s Symphony No.1 and a pioneering recording of Schreker�s opera Der ferne Klang.